Heard in an office – “I hate meetings, they always seem to be a waste of time. But my staff is insistent that we have them, so that we stay in touch with each other. It’s especially important for people in the field who are not around the office every day. I just don’t think we do a very good job with them. So what can we do to avoid “death by meeting”? We are wired to interact with each other for clarity of communication and greater understanding. It is possible to accomplish those things in a variety of ways — letters, emails, texts, posts on social media, voice mails, conference calls, video conferencing and plain, old-fashioned meetings. Using any of these mediums requires preparation and skill to achieve clarity of communication and greater understanding. What is the purpose of the meeting? We could fill this whole column with a list of meeting purposes, but let’s focus on these: clarifying and resolving a problem, announcing an initiative or change, updating progress and accountability, reinforcing company values and strategies, dealing with a crisis or a major opportunity, to name a few. Every meeting should serve a purpose and everyone involved in it should be clear on what the purpose is. Who is responsible for the meeting? The boss? The sales manager? A vendor? A task force or committee? Responsibility must rest with one person. The responsibility can rotate, but all concerned must know the rotation. What is meant by preparation? With the meeting purpose as the context, what are the desired outcomes of the meeting? What is the agenda? Who has the authority to place items on the agenda? Will all the areas of the business involved in the items on the agenda participate? Do all the participants clearly understand what they need to do to prepare for the meeting? Start on time and end on time. 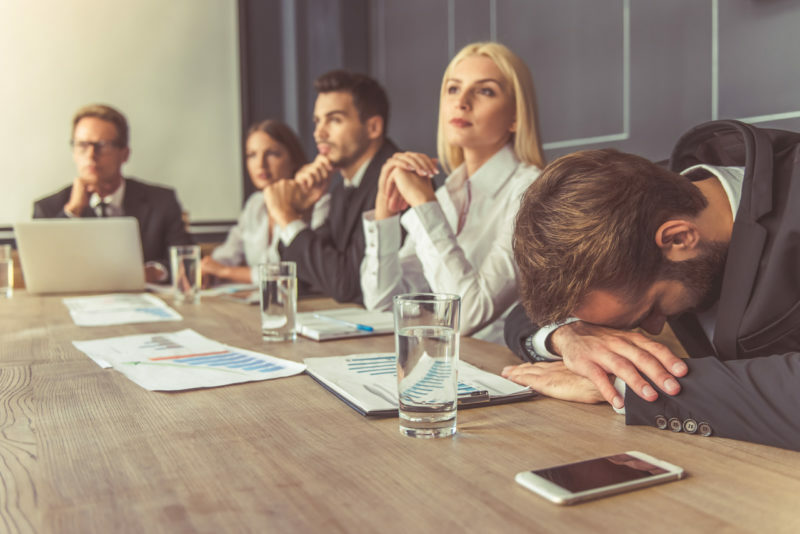 Sloppy agenda management and failure to start and end on time (without agreement from the attendees to extend the meeting) are major contributors to the lack of trust and belief in the viability of company meetings. So start promptly, keep to timelines and end on time. Commitment and lack of commitment are both contagious. If attendees make a commitment at a meeting to do something and they do it, others understand that they need to do the same. Conversely, if people do not keep commitments, then others see that it does not matter. This is where leadership has to set the tone and require the completion of commitments. Depending on the agenda, there is nothing wrong with humor. Humor can be a powerful way to get people to relax and be more comfortable speaking. Of course it depends on the type of humor and the circumstances. Beware of the “elephant in the room.” Sometimes there are subjects that are so laden with controversy or emotion that they become an “elephant in the room,” something very big but ignored because to acknowledge it would cause a firestorm. Whoever is in charge of the meeting should canvass attendees ahead of time to see if there are any elephants that need to be addressed either in the meeting or outside of it. The problem with elephants is that when they are ignored, they just get bigger and stand in the way of progress and the clearing of the air. Who takes the minutes or writes the meeting report? This is actually a very important function and can be a career maker for someone who can write clearly and objectively. It might be the person in charge of the meeting or someone to whom he or she delegates the task. The minutes can form a very important archive of deliberations. The person in charge of the meting should review and approve the minutes or meeting report and request any additions or corrections from the attendees. What kinds of meetings benefit from an outside facilitator? Any meeting where the people involved need to be free of the responsibility of running the meeting and keeping on agenda. It could be a special staff meeting, a partner’s meeting where the minutes can form the required “board” minutes, a board meeting itself or a strategic planning retreat. A trained facilitator can help equalize the participation in a meeting attended by people at various levels of the organization and prevent the dominance of the discussions by a few people, especially higher-ups. Start small. If these recommendations represent a significant change in behavior for your company, start small — with one meeting. Pick one you are in charge of regularly, even the one you hate. Use the tools suggested and see if you and the other participants like the change and feel like progress is made in moving the company forward.